Recently on the blog, I have written about energy technologies that hold great promise for the future. Technologies like carbon capture, advanced biofuels, and hydraulic fracturing. Behind each of these technologies are dedicated scientists and engineers who are advancing discovery and development. And behind each of those innovators are the schools and teachers that helped build up their math and science knowledge. At ExxonMobil, we understand that education is critical to unlocking innovation, which is one reason our foundation chooses to support programs that enhance education in the fields of science, technology, engineering, and math – i.e. the STEM disciplines. One such program is the work we do with the National Math and Science Initiative. As a founding sponsor of NMSI, ExxonMobil has committed more than $180 million to programs dedicated to improving student performance in math and science in the United States. Most recently, ExxonMobil committed up to $13 million to help expand Louisiana’s participation in NMSI’s College Readiness Program. ExxonMobil’s investment will deliver resources to improve student participation and performance in Advanced Placement (AP) coursework, which is a key indicator of success in college and beyond. The College Readiness expansion in Louisiana follows a similar announcement in North Dakota late last year. Since 2008, the program has been implemented in 793 schools across 30 states and the District of Columbia, with impressive results. 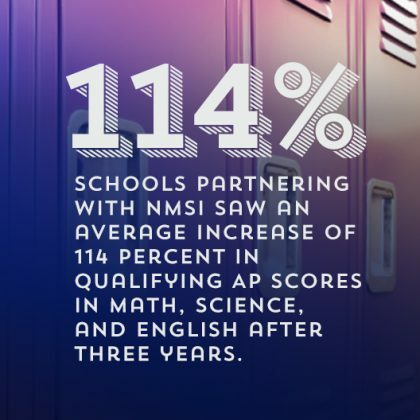 Schools partnering with NMSI saw an average increase of 114 percent in qualifying AP scores in math, science, and English after three years. A Philanthropy News article on the Louisiana contribution stated that ExxonMobil’s partnership with NMSI “makes sense” given our corporation’s reliance on a STEM workforce. That’s true. As a company employing more than 18,000 scientists and engineers, we understand the importance of STEM education in preparing tomorrow’s employees. And we know that the need for highly-skilled scientists and engineers will only grow as we develop technologies to meet the 21st century challenge of expanding global energy supplies while managing the risks of climate change. But STEM’s importance goes beyond just ExxonMobil and the energy sector. Whether the students in these programs become chemical engineers, doctors, software developers, or cybersecurity analysts, their future success will depend upon access to quality education and training. We all stand to benefit from an investment in our schools and students.